I’ve lived in standard stick-built homes most of my life – as, no doubt, have most of you. I still do, when I’m stateside. 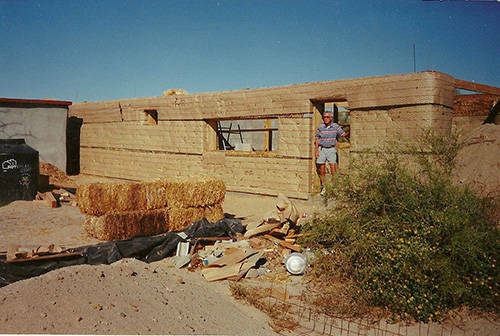 But, back in the 90s I heard about strawbale houses, and since then I’ve always wanted to build one. By the way, if you’re thinking about the tale of the Three Little Pigs, where the wolf blows down the house, you can relax – it’s not the same at all. Anyway, not knowing how to go about it, I visited a California architect who built the state’s first approved strawbale house near Bishop (he then built one for himself, too). Then I moved to Ponderosa Village, an “intentional community” in Washington state. My initial incentive to go there was a strawbale housebuilding workshop they were running; at the time Ponderosa had a variety of other housebuilding methods in use, including rammed earth, earth-bermed, geodesic domes and log cabins, but nobody had built in strawbale yet. What I was looking for was a housebuilding method that I could afford, that was simple enough for a novice builder (although I am pretty handy) and durable enough to last a lifetime or more. The thing is, it’s also great from a prepping point of view. The walls are thick – two and a half feet – and sit on an equally wide concrete foundation to give them stability. The bales are stuccoed on the outside and inside, making them impervious to heat – even the heat from a blowtorch won’t make it through. The bales are pinned to the foundation and extend all the way to the roof line, where they’re pinned again. These are very durable structures – yet building inspectors, who often impose draconian (bordering on fascistic) standards on owner-builders, don’t always “get” strawbale houses. Even if they do understand the concept there usually aren’t any codes for it. In my case the local building official (there was only one) rejected my plans, which had been drawn up by a Seattle-based professional architect – a guy who even helped to “green” the White House. I had dozens of volunteer builders lined up for my job, and then suddenly I didn’t have clearance to go ahead. 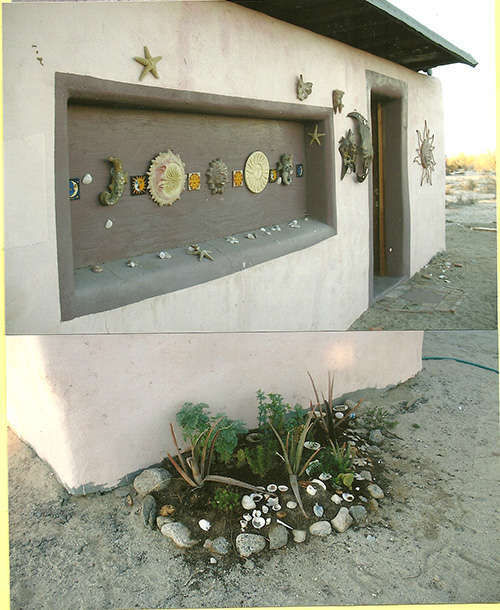 However, in the northern Baja California there’s a community that, today, has almost 100 strawbale homes – including some really luxurious ones. It was a new resort, called El Dorado Ranch (eldoradoranch.com) and I had acquired a plot there with the idea of building on it some day. 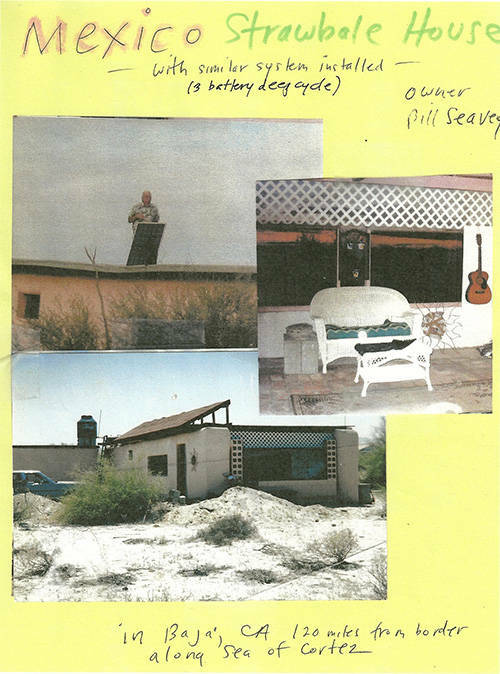 My next step was to haul most of the components of my abandoned Washington house down to El Dorado Ranch in a motor home, minus the bales, of course – those ended up rotting away on my former property that I was, in effect, swindled out of by the building officer. It was different down in Baja California. The locals had begun to embrace strawbale construction, so permitting for my house was almost instantaneous. I made a few modifications from the previous structure, and scaled it back to 900 square feet, then got started. As far as I know it was the second strawbale house at El Dorado, and it turned out to be perfect for the local environment. It did take me years to build in the end, and is still a little rough in places, because I was broke. 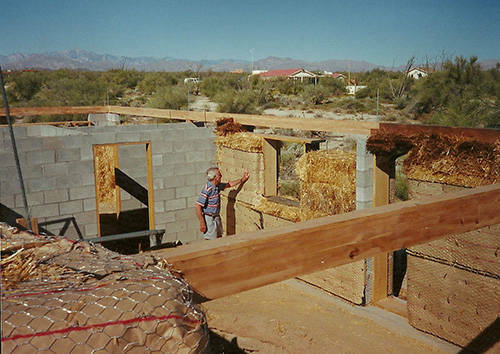 There are two main methods of strawbale construction. The first is where the bales are simply stacked on top of each other and support a roof; I think it was planning to do it this way that finally killed my application in Washington. Then there’s the other way, using corner beams to support the roof. I decided to take this approach in Mexico, using corner beams and a 6×4 beam across the living room (the largest space) to support a flat roof. This method also uses interior walls of painted concrete block, which gives the roof more support. Doors and windows are framed and cut out of the bales. This is a comfortable house to live in. As long as you can draw in cool air at night the insulation of the bales will keep the temperature manageable. Air conditioning in summer will make a big difference where I am; the straw will reduce the amount of heat getting in from outside. To create a cooler space for supplies I dug myself a small basement with a backhoe. 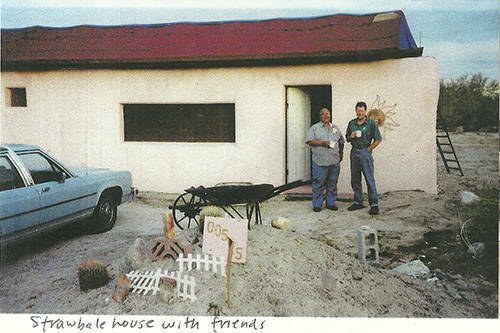 However, I do consider myself a pioneer for having built this type of house in this part of Mexico. Since the 90s the resort has expanded greatly, and this part of Mexico is the only place a gringo can actually own so far (and there’s Remax and Century 21 in San Felipe, the nearby fishing village). The resort is now so large that the town’s commercial focus has moved 15 miles north to provide services to the roughly 1,000 gringos who live at the resort full time, and several thousand more part-timers. For example there’s a medical clinic on the highway just a mile and a half from my “rural” lot. There’s a new aquatic center the same distance away, and a golf course that runs actual tournaments. One reason for the area’s popularity is cost. I estimate that my 900 square foot house cost $25,000 to build, and the 80×90 lot it’s built on cost about $10,000 with a septic tank installed. Now it’s finished, annual taxes run to about $630 (that’s not a typo). 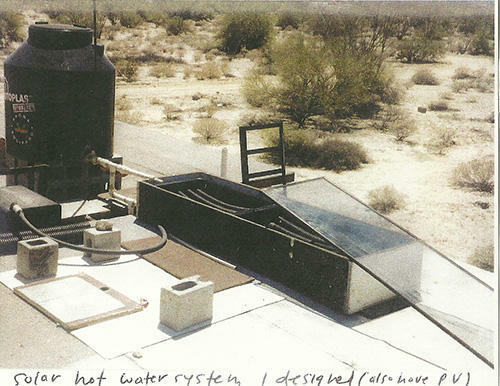 I have a small solar electricity system, water tanks on the adjacent storage building (which is also strawbale) and vistas you wouldn’t believe – yes, you can see the warm waters of the Sea of Cortez from some of my windows. It’s quiet, with few neighbors close by, and I can get a meal in a local restaurant for as little as $5. I call it a Poor Man’s Hawaii. A few years ago I used to run a budget touring program to El Dorado Ranch, showing half a dozen people at a time this beautiful part of Mexico. It’s safe here, the roads are good and the cost of living is very low. The people are terrific, and if you want any building work done you can hire skilled laborers for about $15 a day. Most speak some English, although I usually get by in my pidgin Spanish. I wish I could answer everyone who has questions but if you are sincerely interested in accompanying me on a spring tour, email billseavey@gmail.com. My website is retirementpossibilities.net. 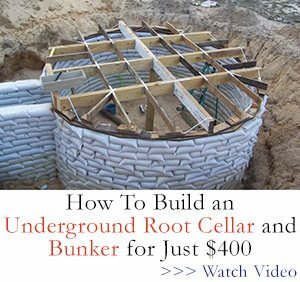 There is a book there on other low cost alternative building methods, which people really need to know about. The cost of housing in the USA is just ridiculous, but strawbale will give you a big cost saving – especially if you build in Mexico like I did. There are a lot of benefits in having a home, even a second home, down here. For a start, it’s far away from all the likely targets! Don’t fall asleep smoking in bed! I just want to point out if it’s not alraedy obvious that it’s virtually impossible to set the house on fire. The bales are stuccoed inside and out with between 1″ and 2″ of concrete and air won’t get in. The floor is ladrillo brick which is actually fired “excrement” and sand. Only the roof is flammable but there is little vegetation around to carry a firestorm. The house will be there a very, very long time as the humidity most seasons is low. I agree that the climate where this particular house is built is ideal for this type of structure. How “water-proof” concrete is depends on it’s composition, and it’s finish. I am not sure that it was mentioned whether the bales were completely encapsulated in concrete (top/bottom of wall), etc. The fact is that in a 4 season climate area of the country, especially if humidity is high, stucco will crack, and humidity will find it’s way into the hay bales. I’m not knocking the basic design, but it may not be the best materials for other parts of the country. I think the straw bale house could work in wet environments with a good waterproof foundation, a good roofing system to keep water away from the bales and a sufficient drainage system to likewise keep water away from the foundation and the bales. Bug infestation of the Haybale‘s might present a difficult problem… I don’t know if they are insect proof or not. I do know that if stucco is applied to All exposed straw surfaces, the bales seem to be impervious at least as much as wooden framing is. 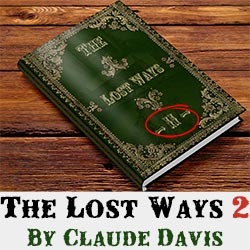 (I don’t think termites eat a straw but of course they do eat wood work.) The cost of the bill house would be proportionally more expensive in terms of the necessary waterproofing. But, it is hard to be the R-value of the wall thickness! That sounds idyllic, Bill! I am going to look into straw bale further for my next project. There is a straw bale house in Ithaca New York I have heard about, that has been there for 20 years. It’s really wet and rainy there, so something must be working well! I like the idea that it’s also about as environmentally gentle a construction as you can get, and more adaptable to many climates than thatched roofs. Actually, those cob houses in England that date back centuries had thick thatched roofs, and it was always rainy there. Not that we would tolerate bugs and vermin falling from the ceiling! Thanks for the article. Yes, we need to get some more affordable housing for the lot of us who don’t have (or want) gold toilet seats! could be just a rumor. In Nebraska they built these as temporary homes, they are still standing after over 100 years. And They will not burn, if there is a fire it will burn it’s self out, no damage. That is so bizarre, Chris. You would think that once one of these houses caught on fire it would burn like there’s no tomorrow. Good to know. THANKS! Interesting article. Curious about the type of foundation. Also, I was under the impression that you could not own land in Mexico without being a citizen. In the desert we would put them in the ground works even better. Second if in the desert and it is 125 outside, it is 68 inside. If its 32 or lower outside its 68 inside. 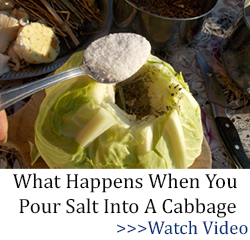 You can also use tube bags filled with a mixture of grass/ hay mixed with horse or cow manure and adobe. My GGrandfather used to make these. 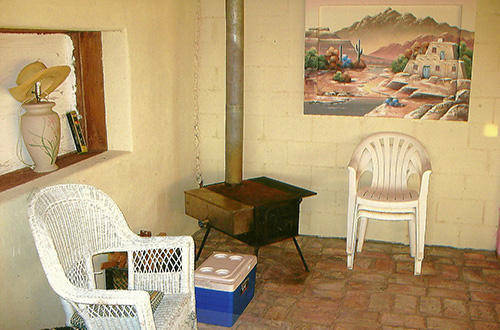 With a fire place it is cozy in winter and cool in summer. I actually believe they are better than the stick houses buit today. Makes perfect sense to me, Wahila. Many, MANY years ago I ran across an article about the Australians doing something of the same sort of thing in the hottest parts of Australia. They would basically dig a cave down into the ground to protect against the heat. I don’t remember the exact details right now or what kind of insulation or if they used any insulation on the roof but apparently these, for want of a better word, caves; were very comfortable inside and quite livable under those very hot conditions. If I was 20 years or so younger I sure would be tempted. We live in Yuma, AZ not far from San Filipe. We’ve camped down there. 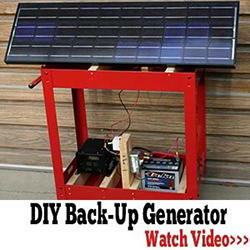 Good project for the younger generations. Yuma a beautiful place. Especially next to the river. I still prefer the earth bag home for many reasons that I won’t go into, but I could see doing internal walls with the straw bale for the additional insulation, and sound deadening. A pretty interesting read as usual from contributors to this site… much food for thought. Hi, dp. You just gave me an interesting idea when you mentioned insulation and sound deadening. It probably sounds pretty goofy but I invite feedback on it. I’m a big proponent of insulating concrete forms and I’ve heard that there may be outgassing problems with the rigid insulation they use. ICF homes are solid, quiet and warm in the winter and cool in the summer. Instead of using RFI between the concrete walls why not use straw bales as the insulation in the space between the walls? I bet you dollars to donuts that those straw bales would provide MUCH better insulation and sound deadening qualities than RFI ever could. From the pictures Bill is still using concrete block for the inside walls and the straw bales just provide the outside walls. So why not go one step farther and build the outside walls as ICF with straw bales as the insulation between? That’s the kind of house I would be proud to live in and I do realize that we’re trying to build the most economical house we can. You get what you pay for. Let me know what you guys think. that is pretty much what I was thinking as well. Most square bales that I have seen will come apart in layers about 4-5 inches thick. That seems just about right for insulation purposes, plus very economical since you will get several layers out of each bale. It would also do away with most water issues caused from using the straw as an outside wall. 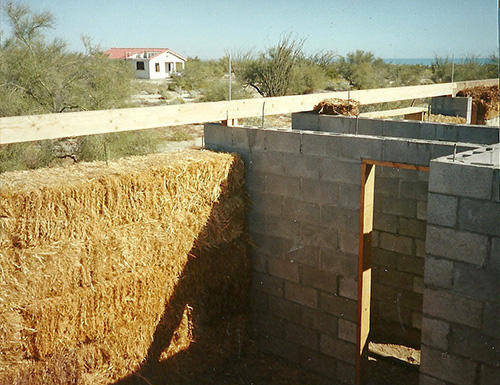 With the straw used directly exposed to the outside, then any problems with your adobe outer skin would wick right into the wall and cause serious structural, mold, and other problems. The only thing that concerns me about this particular building is that he’s built it with a flat roof which to me means that where he is the climate is very dry. When building with straw bale you would probably have to take location into account. As for the wicking problem, dp, he does say that he’s stuccoed the walls inside and out which basically means that he’s applied a layer of plaster inside and out which would help with the moisture problem. Stucco of course needs to be “touched up” every few years depending on the climate. He says nothing about flash floods or anything like that. And the important thing is that it works for him. I have no problem using straw bales as insulation but I do like my walls a bit more solid. 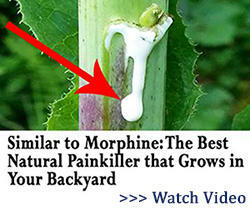 Mother nature still might have a few surprises up her sleeve. I agree that he has made a lot of building choices that will probably work well for him where he is located. Where I am located they would not work as well. Too much rain and humidity here. I do like the idea of using the straw as insulation – commercial insulation being so expensive for what it is. 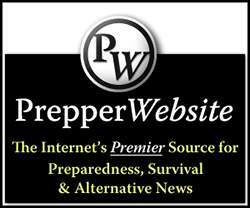 I’ve been doing a lot of research on the subject of straw bale and cob houses, and there’s a lot of information on line. In a wetter climate like England you would need to construct a rubble trench foundation for the walls for drainage as well as an overhanging roof to direct rain away from the walls, but the technique has been used for hundreds of years there with good results. Straw bales are recommended in colder climates because of their insulating quality. Essentially the same basic clay mud straw slurry is used in constructing both types of buildings. Cob is using gobs of the mixture itself to construct your walls, and in straw bale construction the cob mix is applied to the outside if the bales to create a shell around them and allowed to harden. Once this is done, an additional coat of a more water resistant type of stucco is used to finish the exterior, then it can be painted or whitewashed. Do look it up-I think you’ll be impressed with what you find. I would have to admit that this is correct. the whole thing is to keep the straw dry. otherwise it is going to be dampness and the fungus taking over your house. that is where we need a vapor barrior in place. the big problem is mold inside of the wall. 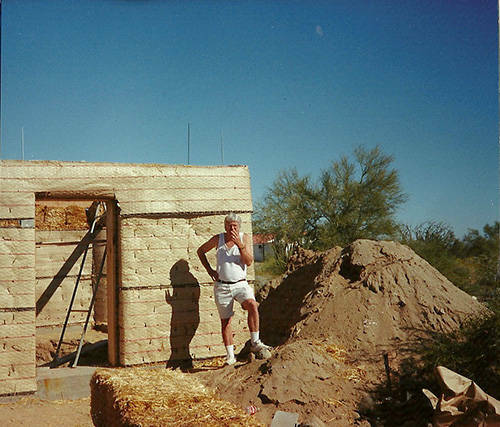 Very cool, I love the old Southwest desert style of diy building from natural materials. Google images of Sublett-Dorgan and also Blue Creek ranch house to see some cool ruins. Love the way doors and windows are framed in these old buildings, same style you followed-reinvented. After hearing of your Straw Home for many years I am so thrilled to see it! Wow… looks great to me!! Hope that you and Eleanor are doing well.. Many hugs to you both !! Thanks Mikki. I don’t plan to comment any more on this piece but today (4/14) the author had a guest who is involved in an organization that helps people get strawbale homes through code. She’s staying at our Airbnb and lives in a sb home in Nevada! She left a flyer about “natural building workshops” involving sb building in California April 20-22 and April 27-29. Go to adaptiveagriculture.org for more info. I am still interested in taking a small group to Baja in late May not only to see the house in person but also to enjoy the sunny coastal shores of the cool resort I belong to. If interested, please email me at billseavey@gmail.com..
My compliments to Bill for a very interesting article on the use of straw bales in construction projects. 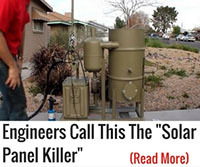 To all, I have a question that stems from one of the latter emails about using flakes of straw for inner-wall insulation. Having had a stick-built 16X24′ detached garage added to a lot in the UP of MI where snow and cold abounds in the 6 or 7 months of Winter, I’m wondering how that form of insulation would perform between 2X4 studs 16″ on center. I would appreciate any comments or suggestions to Twogunbruce@gmail.com. The interior is unfinished…no sheetrock or ceiling, no wiring in the walls yet, etc. I have several sheets of pegboard that I planned on installing, and could be used in place of sheetrock so I can employ pegs for hanging small items on the walls. Romex can be run through schedule 80 PVC and secured to the walls. It was cold in there this past Winter, and the thought of the cost for polystyrene insulation is overwhelming. Comments are welcomed. Just my personal opinion on the use of straw for insulation. If I were to use straw I would use a vapor barrier on both sides of the straw, and using square bales I would use the layers of straw that easily separate from those bales rather than using blown straw. For the peg board I would put additional support (cross beams) in those areas. Then I would drywall those areas as usual, and use spacers to create clearance between the drywall and peg board.